Please read and agree with the following terms and conditions before completing your booking with Capercaillie Escapes Ltd. These, along with receipt of your booking deposit, form the basis of the contract between you and Capercaillie Escapes. Please note, the use of the terms ‘we’ or ‘us’ refers to Capercaillie Escapes, and the ‘client’ or ‘you’ refers to the individual making the booking. Capercaillie Escapes Limited (Reg: SC558261) of 27 Lawhead Road East, St Andrews KY16 9ND (“we” / “us” / “our”) is the travel organiser for your holiday. Established in 2014 and welcoming guests from around the world since, Capercaillie Escapes, offers a uniquely tailored travel planning service for trips and events across Scotland. Using local knowledge and experience we are passionate about inspiring travel, great seasonal Scottish food and appreciating the natural beauty, wildlife and hospitality of Scotland. All of our packages are delivered and financially protected in alignment with The Travel Package Travel and Linked Travel Regulations 2018. 2.3 If when you make a booking with us it is for another third party travel supplier’s package holiday, then we are not the organiser of that third party travel provider’s package and in those instances we are acting as agents for the suppliers of those packages, as indicated to you in your Booking Confirmation. When bookings are made for those third party package providers then we will arrange for you to enter into contracts with those third party package providers, on their terms and conditions, which will apply to your booking. If you wish to book a package with a third provider who is not Capercaillie Escapes, then this will be confirmed to you at the time of book. We are a company committed to customer satisfaction and consumer financial protection. Where you purchase a package holiday through us which we have organised as the package provider, we are pleased to announce that, at no extra cost to you, we will provide you with financial protection by ensuring that all elements of the package holiday are provided subject to a policy of insurance that is compliant with The Package Travel and Linked Travel Regulations 2018. We have taken out a policy of insurance with Affirma, a trading brand of MGA Cover Services Limited under a binding authority with Evolution Insurance Company Limited (“the Insurer”, registered in Gibralter No. 88737 with a registered office at 5/5 Crutchett’s Ramp, Gibralter, GX11 1AA, to financially protect all money you pay to us. You are fully insured for the initial deposit, and subsequently the balance of monies paid as detailed in your booking confirmation. Evolution Insurance Company Limited is licensed by the Financial Services Commission in Gibralter under the Financial Services Act to carry on insurance business in Gibralter, and authorised and subject to limited regulation by the Financial Conduct Authority (FCA) in the UK. Our policy number is EVO/FII/2019_0007. In the unlikely event that we become insolvent, our insurer will generally make money available to pay for your holiday if we have not yet paid our suppliers. In some cases your holiday may continue as the providers or suppliers have already been paid, however this depends on how far in advance of your holiday it is at the time we became insolvent. For example, where you have only paid a deposit and still have an outstanding balance, your holiday may be unaffected and by paying the balance your holiday will continue as planned. Where possible, attempts will be made to ensure that you can carry on with your original holiday arrangements. For any claims you should contact Claims Department at Affirma – Address: 152 City Road, London, EC1V 2NX, Telephone: +44 (0) 203 540 4422, Email: claims@affirmainsurance.com. Please note that our travel packages do not include flights, therefore we would not be obliged to repatriate you due to the package being for land arrangements only and not a flight. If you are flying to the destination, then you will need to check what protection you have for repatriation with your relevant flight provider. The policy will not cover any monies paid back to you by your Travel Insurance or any losses which are recoverable under another insurance or bond (with the exception of Credit and Debit card). 4.1 You can make an enquiry for a holiday via our website, email or over the telephone to us. For our bespoke holidays, we recommend making an enquiry at least 8 weeks prior to your desired travel dates. If you make an enquiry less than 8 weeks prior to your desired travel dates, we will use reasonable endeavours to deliver your holiday according to your requirements, but please be aware that some services may be fully booked, particularly in peak travel seasons. 4.2 Our featured ‘sample itineraries’ do not constitute offers by us to supply you with a holiday based on a sample itinerary for dates chosen by you or at a certain price. All enquiries for sample itineraries are subject to our trusted service providers’ availability at the time of booking, and you acknowledge that the price for the itinerary may vary depending on your desired travel dates and the lead time to your travel. We recommend that you enquire to purchase one of our ‘sample itineraries’ at least 4 weeks prior to your desired travel dates. 4.3 We shall under no circumstances be liable to you if services are unavailable or are unavailable at certain prices at the time of enquiry or booking. 4.4 Once you have enquired about booking a holiday with us, we will provide you with a Travel Proposal, which will include a high level travel itinerary and our quote for the services listed in the proposal. All quotes are subject to revision until we have confirmed your booking and, depending on how close it is to your time of departure, you have paid an initial deposit or the total cost of your holiday. The only inclusions for your holiday are those inclusions specified in our quote and itinerary. For the avoidance of doubt, international or domestic airfares, food and beverage, fuel for self-drive holidays, personal travel insurance, optional activities and excursions and gratuities are not included in your holiday unless our quote or itinerary specifies otherwise. 4.5 When we make a booking for your holiday, we use the details you have provided to us, therefore it is important that all the names, contact addresses, emails, telephone numbers, and dates for travel that you have provided to us are correct. We shall forward to you a Booking Confirmation with full details of your holiday booking. Please check this through thoroughly upon receipt to ensure that these details are correct. We do not accept any liability for errors in documentation if you do not advise us within 14 days of their issuance. Making changes to a confirmed booking may incur charges (as detailed below), therefore it is important that you ensure that information provided to us is correct to avoid any charges. 4.6 If you make any special requests prior to booking, we will confirm whether these can be accommodated in your Booking Confirmation. If you make special request at the time of or after booking, we will endeavour to work with our suppliers to accommodate these requests, but we cannot guarantee that they can be accommodated and we shall not be responsible to you if they cannot. You acknowledge that in some remote areas, accommodation and other services may lack simple facilities for the disabled or those with mobility issues. If you or a member of your party has accessibility requirements or has a disability, you are required to advise us prior to booking so that we can make suitable arrangements or offer alternatives. 5.1 When you make a booking with us which is confirmed more than 8 weeks prior to your travel, you will be required to pay a 25% deposit, with the balance being due at least 6 weeks prior to travel. If you make a booking with us which is confirmed less than 8 weeks prior to travel, you will be required to pay the total cost of your holiday at the time of booking. Invoices for deposit amounts are due within 10 days and, in the event of a booking made less than 8 weeks prior to travel, the total amount, is required to be paid as clear funds within 72 hours of receipt. 5.2 You may make payments by bank transfer, cheque or credit/ debit card. Our preferred method of payment is bank transfer (domestic and international) in Pound Sterling (£) or through our secure online payment form. Bank account details for domestic and international transfers will be specified on our invoice to you. So we can assign your payment to your booking, you must include your reference number (as per our Proposal/Deposit Invoice for any deposit payment, and as per our Booking Confirmation for any balance payment) and the lead traveller last name. 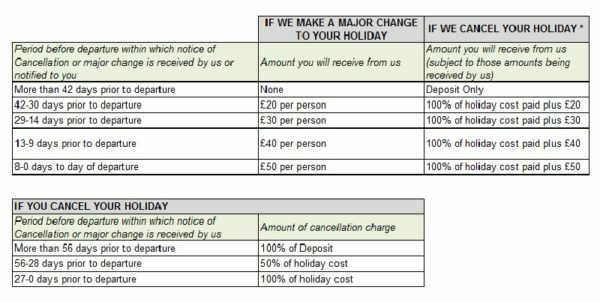 5.3 When we make our holiday packages available to you, if you do not pay the balance of amount due to us for your holiday by the due date, then we may cancel your travel arrangements and retain any deposit you have paid to us. 5.4 When you are booking a package with us, you should be aware that there may be changes in transportation costs, including the cost of fuel dues, taxes and exchange rates meaning that the price of your travel arrangements may change after you have booked. However there will be no change within 30 days of your departure. We will absorb and you will not be charged for any increase equivalent to 2% of the price of your travel arrangements, which excludes insurance premiums and any amendment charges. You will be charged for the amount over and above that. If this means that you have to pay an increase of more than 10% of the price of your travel arrangements, you will have the option of accepting a change to another holiday if we are able to offer one (if this is of equivalent or higher quality you will not have to pay more but if it is of lower quality you will be refunded the difference in price), or cancelling and receiving a full refund of all monies paid, except for any amendment charges. Should the price of your holiday go down due to the changes mentioned above, by more than 2% of your holiday cost, then any refund due will be paid to you. However, please note that travel arrangements are not always purchased in local currency and some apparent changes have no impact on the price of your travel due to contractual and other protection in place. 6.1 If you wish to cancel or amend a booking, then you must notify us in writing of what amendments or cancellations you wish to make. However, please note that you may not be able to amend or cancel a booking once it has been confirmed as a supplier may not permit this.. Since we incur costs in cancelling your travel arrangements, you will have to pay the applicable cancellation charges up to the maximum shown in the table at the bottom of this clause 6. We shall endeavour to make amendments or cancellations of your travel arrangements where possible and shall confirm any agreed amendments or cancellations to you once completed, together with any applicable costs or charges. 6.2 If you have booked a package holiday with us, we may need to make changes to your travel arrangements. Although this is unlikely, we reserve the right to do so at any time. Most of these changes will be minor and we will advise you of them as soon as possible. If we make a major change to your holiday, we will inform you as soon as reasonably possible if there is time before your departure. You will have the choice of either accepting the change of arrangements, accepting an offer of alternative travel arrangements of comparable standard from us if available (we will refund any price difference if the alternative is of a lower value), or cancelling your booked holiday and receiving a full refund of all monies paid. In all cases, except where the major change arises due to reasons of force majeure (as defined below), we will pay compensation as detailed in at the bottom of this clause 6. The compensation that we offer does not exclude you from claiming more if you are entitled to do so. 6.3 We also reserve the right in any circumstances to cancel your travel arrangements. However, we will not cancel your travel arrangements less than 10 weeks before your departure date, except for reasons of force majeure or failure by you to pay the final balance. If we are unable to provide the booked travel arrangements, you can either have a refund of all monies paid or accept an offer of alternative travel arrangements of comparable standard from us, if available (we will refund any price difference if the alternative is of a lower value). If it is necessary to cancel your travel arrangements through no fault of your own, we will pay to you compensation detailed in the table set out at the bottom of this clause 6. We are not required to pay you compensation if we cancel your package because of reasons of force majeure or through some fault of your own. It is your responsibility to ensure that you and all members of your party are in possession of all necessary travel and health documents, and in compliance with any other immigration requirements, before you travel. If you or any member of your party is not a British Citizen or holds a non-British Passport, you must check passport and visa requirements with the British embassy in your country of nationality. Neither we, nor the supplier(s) of travel services, accept any responsibility if you cannot travel because you have not complied with any passport, visa or immigration requirements. Please ensure that all your travel, passport, visa and insurance documents are in order. Whilst we do everything we can to provide you with a trouble free and enjoyable experience, we do understand that occasionally things do not always go to plan. If you have a problem during your holiday, please inform the relevant supplier (e.g. your hotelier, activity provider etc) immediately, who will endeavour to put things right. It is strongly recommended that you communicate any complaint to the supplier of the services in question without delay. The amount of compensation you may be entitled to may be reduced or you may not receive any at all depending upon the circumstances. Please also inform us of any problems as soon as possible so we can work with the relevant supplier to put things right. Notwithstanding, if you have a complaint you are required to advise us within fourteen (14) days of completion of your travel arrangements. If you, or any member of your party, cause damage to any accommodation in which you are staying or to any property of suppliers of tours, excursions or other elements of your holiday arrangements, including any hire cars, you must fully reimburse the accommodation provider or relevant supplier concerned for the cost of the damage before the end of your holiday (if the cost has been established by then), or as soon as it has been established if later. You agree that you will be responsible for and will protect us against the full amount of any claim (including all legal costs) made against us by the relevant supplier or third party as a result of such damage caused. 9.1 If you have booked a package holiday with us and your holiday is not performed or is improperly performed as a result of failures attributable to a third party unconnected with the provision of the services, or as a result of failures due to unusual and unforeseeable circumstances beyond our or the suppliers’ control, the consequences of which could not have been avoided even if all due care had been exercised, or an event which we or our suppliers, even with all due care, could not foresee or forestall, and you suffer an injury or other material loss, we will offer you such prompt assistance as is reasonable in the circumstances, but to the full extent permitted by law we shall have no further liability to you. 9.2 When you have booked a package holiday with us and if the contract for the provision of the travel services is not performed or is improperly performed by us or our suppliers, we will pay you appropriate compensation if this has affected the enjoyment of your travel arrangements. However, we will not be liable where any failure in the performance of the contract is due to: you; or a third party unconnected with the provision of the travel arrangements and where the failure is unforeseeable or unavoidable; or unusual and unforeseeable circumstances beyond our control, the consequences of which could not have been avoided even if all due care had been exercised; or an event which we or our suppliers, even with all due care, could not foresee or forestall. 9.6 When we are not providing a package and to the extent that we are acting only as agent for other suppliers the provisions in 9.1-9.3 above relating to liability do not apply and any terms relating to liability to customers under such arrangements will be set out in the relevant suppliers’ terms and conditions. You are required to have in place appropriate travel insurance in order to fully cover you and your party. 11.1 If your holiday includes a rental car, you acknowledge that if you are a British citizen, you will be required to present your driver licence and a DVLA check code. If you are not a British citizen, you will be required to present a valid international driver licence and your passport. (c) we may reserve the vehicle and pay either a deposit or the full rental amount to the supplier. 11.2 If we reserve a vehicle on your behalf, you agree that you will be principal renter of the vehicle and will be required to pay any balance payments and to provide a security deposit to the rental company (usually by way of a pre-authorisation to your credit card). If the rental company makes any claim against us in connection with your rental of the vehicle, then you agree that you will be solely responsible for and protect us against those claims. These Terms and Conditions are governed by the laws of Scotland and the jurisdiction of the Scottish courts. You may however, choose the law and jurisdiction of England and Wales or Northern Ireland if you wish to do so. The registered office of Capercaillie Escapes from 7 November 2018 is at 27 Lawhead Road East, St Andrews, KY16 9ND. We can also be contacted at info@capercaillieescapes.com or by calling +44 (1334) 845 440.